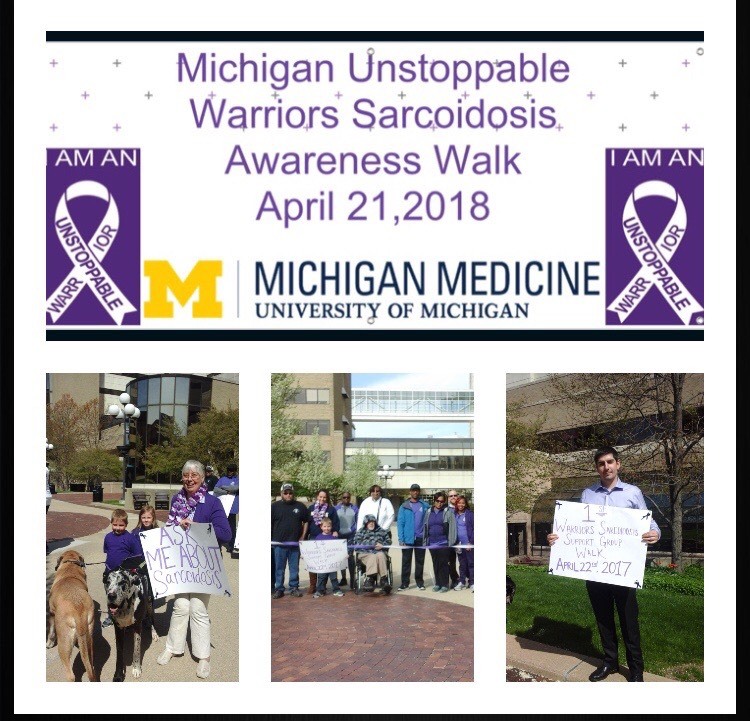 Walk of the Week: Michigan Unstoppable Sarcoid Warriors Walk! FSR is hosting our fifth annual Team KISS 5K Run/Walk in Atlanta, GA this year. This event helps raise awareness about sarcoidosis while also fundraising for critical research and patient support programs. But the event is more than just a walk- it’s a movement. We work with volunteers from all across the globe to help them start their own independent Team KISS walks that correspond with our event in April, Sarcoidosis Awareness Month. We even have a virtual walk option, where you can join in on the fun (and still nab a Team KISS t-shirt) even if you’re unable to attend an event in person! This way, sarc warriors and their loved ones from all corners of the US and abroad can join us as we Kick In to Stop Sarcoidosis! This year, we’re highlighting some of our super awesome independent walks, like the Unstoppable Warriors Walk in Ann Arbor, MI! Read more about their event on April 21st below! More than a walk… It’s a movement! For every patient, family members, friends and doctors who shows or has shown great vigor, courage and aggressiveness in fighting sarcoidosis! For every person who yet don’t know they too may become a warrior in fighting sarcoidosis! For those with strength and force currently fighting sarcoidosis! For those with spirit and without fear in fighting sarcoidosis! I was diagnosed 25 years ago and this walk is to celebrate that sarcoid will not break me! I ask you to join me in walking to celebrate your fight plus the celebration of life ceremony. . This walk is open to “EVERYONE” who wants to celebrate someone fighting this disease or has fought. I would like to simply say, stay focus and believe in yourself! If a lemon gets thrown your way make lemonade and keep it going!!! Own who you are and know that we’re all Unstoppable Warriors in one way or another!